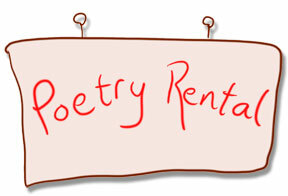 Hertz Rent-a-Poem is pleased to announce the sale of our quality, pre-owned poems -- now at lower prices! These are not stripped down one-liners. All of these poems contain luxurious appointments such as internal subtexts, obscure metaphors, memorable sound bites, and multiple levels of subtle contextual perspectives that will bring a wry smile to your face and impart a sense of your superior linguistic skills. You will be the hit of the evening when you arrive with any of these. From the subcompact Haiku to the flowing lines of the modern Epics, to the taut, street-wise Slams, you will be the envy of any social situation. "I caught this morning morning's minion"
"I caught this minion this morning, it's morning's, s'morning...good morning..."
2. Accidentally changing Eliot's "I should have been a pair of ragged claws, scuttling across the floors of silent seas," to "...scuttling across the sores of silent fleas." shall not be covered by this policy. These poems are sold as is. The usefulness of a Haiku is temporary, and may only last the length of one attempt to get laid. Klingon epic poetry recited at a Superbowl party during a third quarter rout of the local team has been known to be fatal. Please recite sensibly. So funny! I love it, Laura. Now, where can I rent a poem for the weekend? And -- this is a worry -- is it okay for me to not be gaunt if I have a Ph.D. in English? Thank you for your comment on our gaunt policy. We have in the past offered our services to robust, good-looking people who claim an Angst value of 900 to 1100 angstroms, only to find out later that they were just trying to impress their frat brothers with a few lines from La Belle Dame Sans Merci or Dover Beach. We did not deem this part of our service practical, as it was pitting at the same party a person earnestly competing to get laid by using Ode to a Nightingale against some jock across the room burping it out. And continuing in the same vein, how would one know if Beowolf was being burped out or simply being recited correctly? That is why we discontinued our services to these people. But it has been brought to our attention that new groups of gaunt-denied persons of social ineptitude have begun to appear at parties, e.g. Linux Sysadmins, MBAs, Hotel Management Majors, and, as you point out, Multiple Degree Holders With No Discernible Future in Any of Them. We are effecting changes which will make poetry available to this new customer base. Thank you again for your concern. This page contains a single entry by laura published on June 18, 2010 10:38 AM. make your own intestine tea cozy was the previous entry in this blog. computer monitor droppings is the next entry in this blog.